Admissions - University of Information Science & Technology "St. Paul the Aposle"
You have three opportunities to enroll in a program at a school of your interest: see Important Dates above. Note that each school is allocated with a maximum quota of students, and no students shall be allowed to enroll after the maximum quota is reached. Hence, it is advisable to enroll as early as possible in order to increase your likelihood of being accepted at our university. 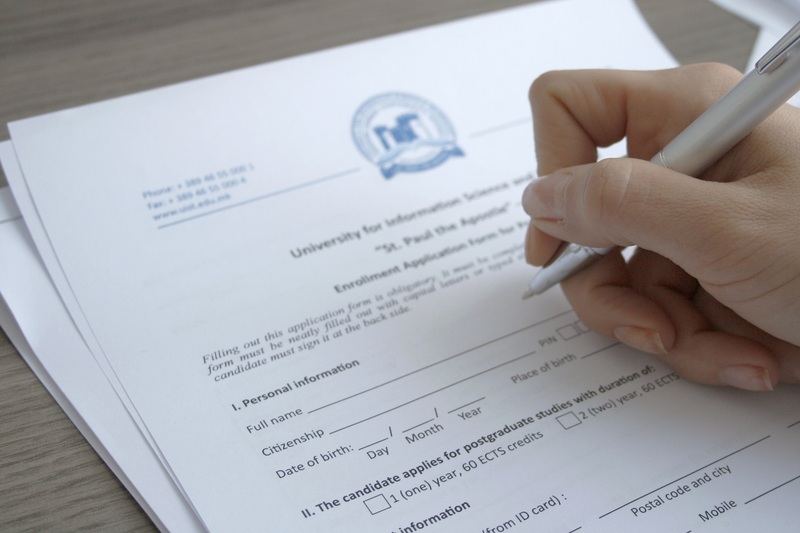 All interested international students who want to apply at the University of Information Science and Technology for undergraduate and graduate studies, should contact at: contact@uist.edu.mk. International students are required to pay a tuition fee of €500 per semester. The admission procedure for Macedonian students is outlined below (Click on the relevant links for more information). 1. Check important admission Dates. 2. Check the admission Requirements. 3. Choose a school at which you want to enroll. 4. Pay an enrollment fee into the university’s bank account. 6. If you meet the admission requirements, you need to proceed to pay tuition and administrative fees. 7. Submit the bank receipts (obtained in step 7) to the administrative office and you will be issued with official confirmation of your successful enrollment in a particular program.